Another weekend, another game of Saga. This time we decided to play the “Kill the Warlord” scenario with the same two 5 point forces which I used in the solo game last week. The Anglo-Danes had a unit of Levy archers, 2 units of Coerls (Warriors) and 2 units of Huscarls (Hearthguard – one unit with axes), while the Normans had 3 points of mounted Knights (Hearthguard) and 2 units of Sergeants (Warriors), one unit armed with crossbows the other with spears. Nick however decided to split his Knights into 3 units of 4 instead of 2 units of 6 as I had done, a decision which was to prove crucial to the number of Saga dice he got later on as he could lose a unit and still roll 6 Saga dice. I resisted the urge to split my levy archers in two and that turned out to be a good decision as well. The Normans chose 1 as their terrain number (predictable for cavalry) while I chose 5 (predictable for infantry facing cavalry) so 3 terrain pieces it was. A large area of rocky ground and 2 forests went down and I was quite pleased with the end result because I thought my levy bowmen could hide in the rocky ground which counted as hard cover, while the layout of the terrain would channel the Norman cavalry. The Normans split their cavalry between the flanks, 2 units of 4 on one flank with 1 unit of 4 on the other and their crossbows seemed to have the same idea as my levy archers about occupying the rocky ground. 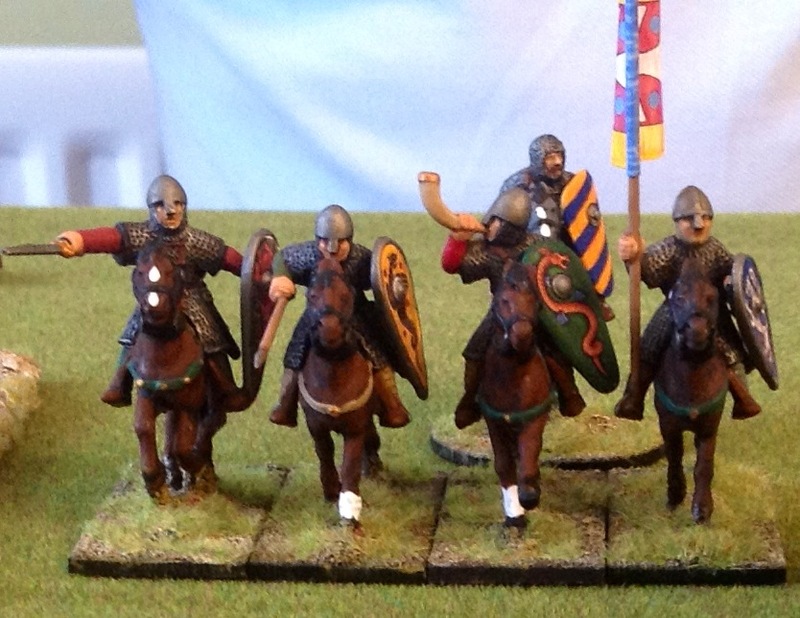 The Normans got the first turn and activated a unit of Knights with “Gallop” straight into my left hand Coerl unit. Luckily I had placed a dice on “Intimidation” and cancelled the move – then the Knights activated normally but they were just outside charge range, so both cavalry units moved up ready to pounce next turn. The Normans also moved their crossbows up to the edge of the rocky ground and their left-hand flank cavalry moved towards my right flank. I sent my axe armed Huscarls to cover the cavalry on the right flank, and moved the exposed Coerls back out of charge range of the other Norman cavalry. The levy archers fired at the crossbows and took down 2 – not bad at all! Next turn, the Norman crossbows activated first, taking down 2 levy. They activated again intending to shoot at my levy archers with the “Storm of Arrows” ability, but a dose of “Intimidation” from my Anglo-Danes saw off this attempt. The Norman cavalry on both flanks again edged forward while building up battleboard abilities to put on their charges next turn. Not to be outdone, I noticed that the cavalry on my right flank had moved within charge distance of my Huscarls with axes, so I put down some combat abilities on the battle board and charged the cavalry. I came close to wiping them out, but 1 out of 4 escaped for the loss of 1 Huscarl. My archers meanwhile took down another crossbowman. 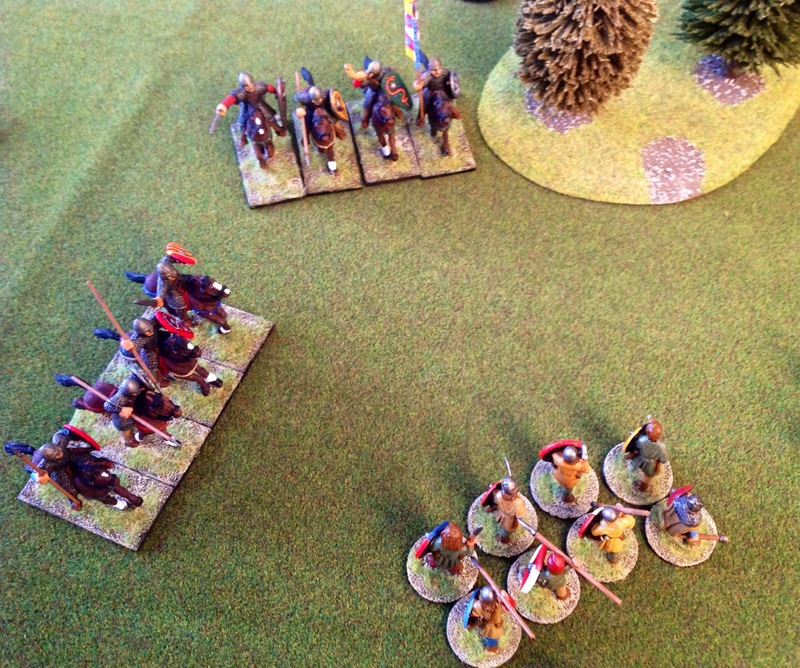 Then came the Norman charge against my left hand unit of Coerls. They were tooled up with “Stamping” – I had “Shieldwall” and “Lords of Battle” but still lost the melee (lousy dice rolls) and fell back, though the Normans had to take 3 fatigue due to “Lords of Battle” . The crossbowmen continued their archery duel with my levy but even though they were hitting on a 2+ I managed to save all the hits. In my turn I slammed my Huscarls into the Norman cavalry I had fatigued in the previous melee, but surprisingly lost despite a few choice abilities and had to fall back. My axe Huscarls raced to get back to the action from the right flank while the levy downed another crossbowman. 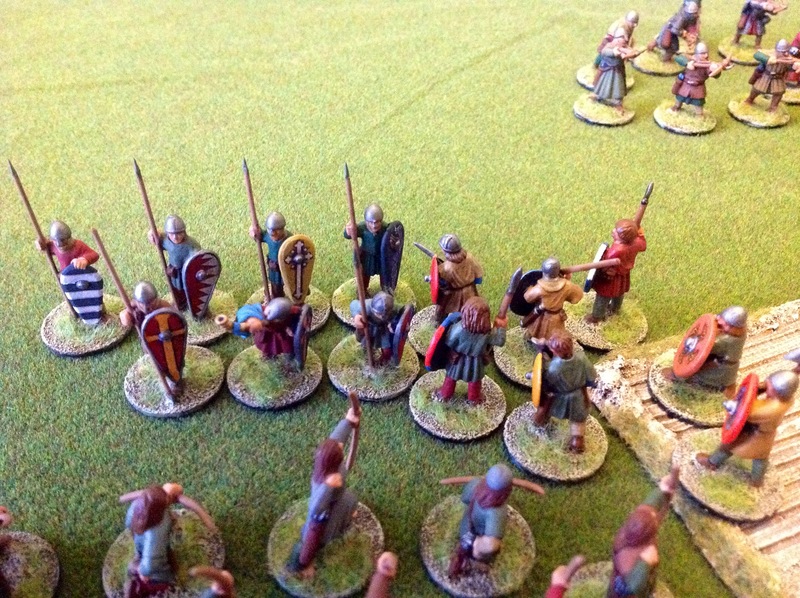 The Normans retaliated by counter charging against my Huscarls with “Charge” and “Stamping” abilities and my unit ceased to exist – I was now down to 5 Saga dice. Using “Follow Me” my Warlord took a unit of Coerls against the weakened Knights and wiped them out for the loss of 2 of their own, However the way the combat had ended there were no figures close to my Warlord, so no-one could absorb his wounds. 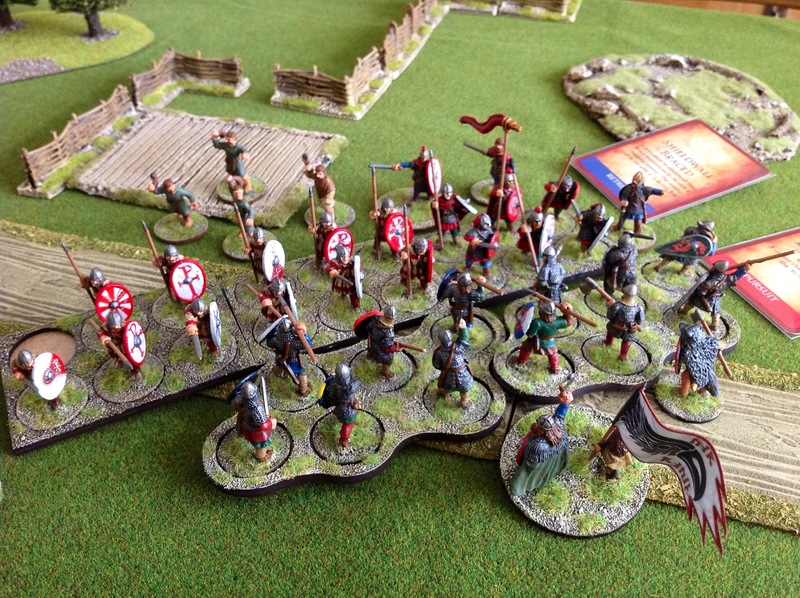 Even though they had lost a unit the Normans still had their full 6 dice and, with my Warlord left out on a limb, right on cue the Normans rolled 2 “Flags” which allowed them to put dice on the Dex Aie ability (Warlord gains 5 attack dice and re-rolls any failed to-hit rolls – arghhh!). He tried to rest first – I stopped that nonsense with “Intimidation” but couldn’t stop the “Obey me” move as no dice had been expended, so the cavalry and Warlord crashed into my Warlord with not a Coerl or Huscarl in sight to absorb a wound – oh dear. I picked this moment (for the first time ever I think) to remember that Anglo-Dane Warlords have an armour of 4 because they are swinging Dane axes – DOH!! As it turned out, even with the nearest unit of 6 Coerls had all been within 2″ (unlikely) my Warlord was dead meat as 8 kills got past my saves, so it was game over. I really enjoyed this game even though I lost – we’re getting to know the battleboards better so there is some planning going on now rather than just random activations. The next step up will be to play with 6 point Warbands (I’m working on it!) and then to paint the Scots Warband for my son to use in our Easter game when he’s back from Uni – where I’m going to find the time to do all this is another thing! After our hugely enjoyable 3-way Christmas game of Saga, we’ve decided to try a 2-player game next week. I thought I’d give the “Clash of Warlords” scenario a run-through to refresh my memory on the rules (it’s been at least 3 weeks!) and as I’ve been busily painting my namesake Normans over the holidays, I could give them a run out against the Anglo-Danes at the same time. 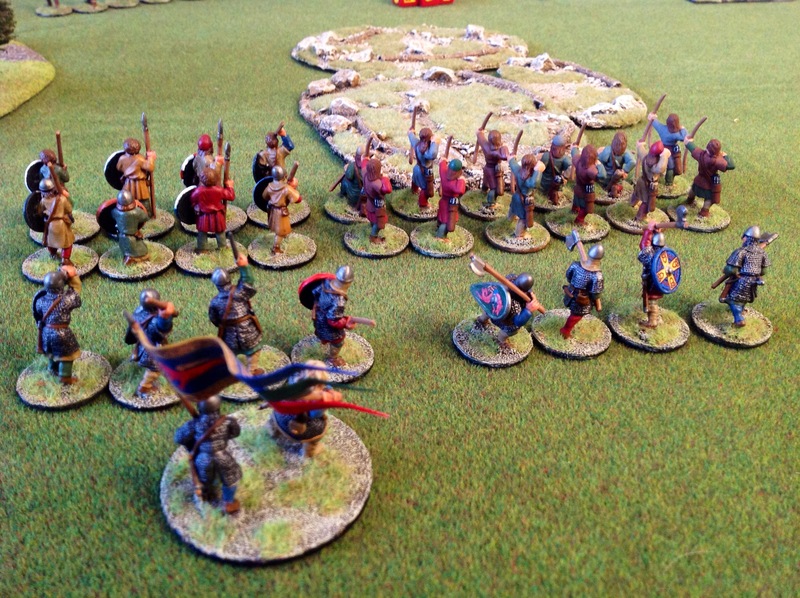 Each side had 5 points in Saga terms – the Anglo-Danes had 1 unit of Levy archers, 2 units of Coerls (Warriors) and 2 units of Huscarls (Hearthguard – one unit swinging axes) giving an initial 6 Saga dice to roll. 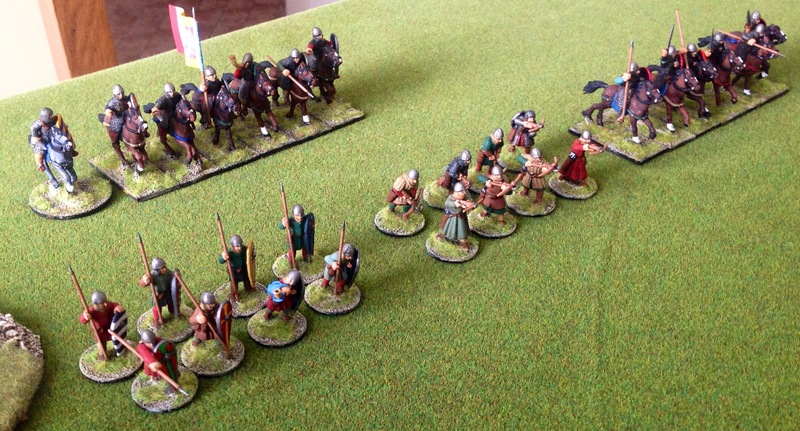 The Normans had 3 points of mounted Knights (Hearthguard) organised into 2 units and 2 units of Sergeants (Warriors), one unit armed with crossbows the other with spears – again giving a starting 6 Saga dice to roll. Another reason for running through solo was that I had not used missile troops or mounted troops before, so no doubt would be scratching my head over some rules issues! I allowed the side going second (the Anglo-Danes) to use the new rule introduced in “Raven’s Shadow” where they could roll and place 3 Saga dice to set up some defensive abilities to mitigate the disadvantage of going second – I placed a “Helmet” on “Intimidation” to cancel an action, but I had no suitable rolls to allow defence against those nasty crossbows, so 2 “Axes” went on the melee ability “Hard as Iron” and we were ready to roll. Turn 1 was fairly predictable with the Norman crossbows attempting to move into range and unleash “Storm of Arrows” which allows them to shoot with no fatigue even if on a 2nd or subsequent action. They were slowed down by “Intimidation” but got half their number into range only for all the shots which hit to be saved. The left-most units of Knights set off on a flank march around the wood. In response the Anglo-Danes advanced their archers into range of the crossbows and unleashed a volley – unshielded as they were the crossbows suffered 4 hits but saved every one! 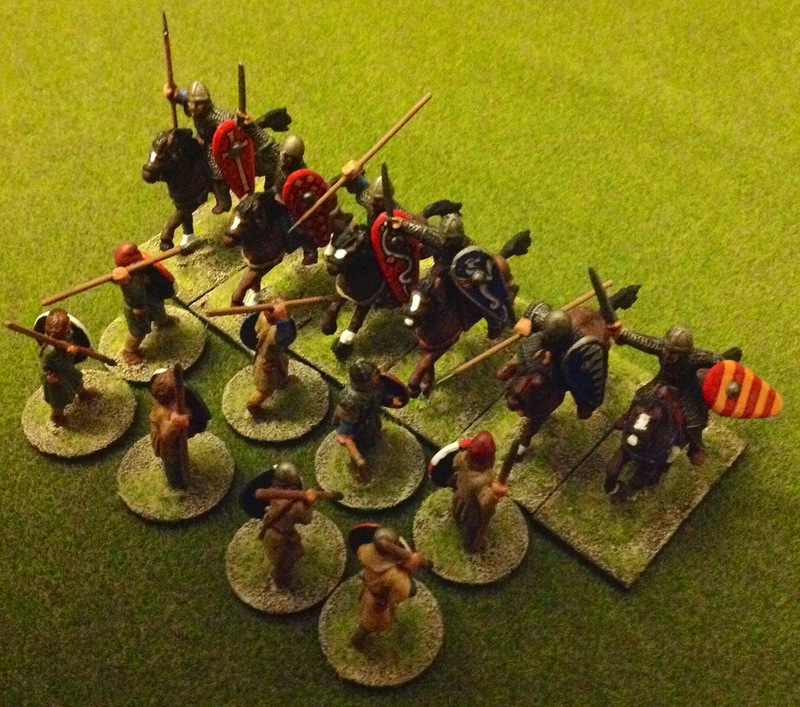 The rightmost unit of Coerls were moved to put them between the axe-armed Huscarls and the flanking Norman cavalry. 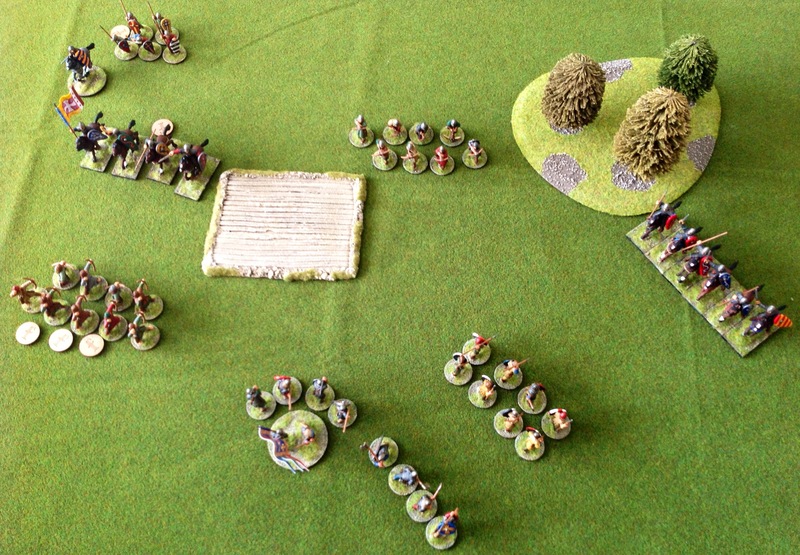 Turn 2 saw more shooting by the crossbows – this time against the levy archers which drew out “Intimidation” – activated for a 2nd time the crossbows only managed to kill 1 archer, rolling two ‘1’s on 4 dice! The Norman Warlord used his free activation to send his spearmen toward the archers and a second action put them into melee. Despite loading up on attack dice, the spearmen only scored 3 hits to 1 and as the levy had loaded up on defence dice they saved all 3 hits so the spear fell back, though at no loss to themselves. Facing the cavalry threat on the flank, the Anglo-Danes refused their flank, shot their archers at the spears who had backed off from the drawn melee (but only killed 1) then charged the spears with their own Coerl spearmen backed up with a “Shieldwall” ability. Because they came across a ploughed field only 4 managed to contact, but it was enough to kill 2 Normans in exchange for 1 Anglo-Dane. The Norman crossbows now had a new target and all loosed off at the Coerls who were now in front of the archers. 3 hits and 3 saves of 2, 2 & 1 left 3 dead Coerls and an opening for the Norman Knights with their Warlord. Using abilities built up ready for this moment the Knights charged through their own spears, rolled an insane number of attack dice combined with the “Stamping” ability which inevitably wiped the unit of Coerls out and put a fatigue on the levy archers for the loss of 1 Norman Knight. With no abilities left on the board but facing a full volley from the archers the Norman Knights careered into the archers as a 2nd activation. Though they managed to take down only 1 Norman Knight in exchange for 3 of their own and had to retreat, this wasn’t too bad for the archers as the Norman had run out of activations it was now their own turn. Even after a bit of a rest (as an action), the archers were still exhausted and the Anglo-Dane dice were used to build up abilities rather than activate units. The game situation at this stage is shown below – what happened on the Anglo-Dane right flank was going to decide the game. First though the Normans attempted to dispose of the levy archers for good, which they reckoned they could do without using any Saga abilities – they were right given that the Warlord and Knights together scored 13 hits out of 13 dice of which the levy only saved 4, so the levy vanished gaining the Huscarls guarding the Warlord a fatigue. 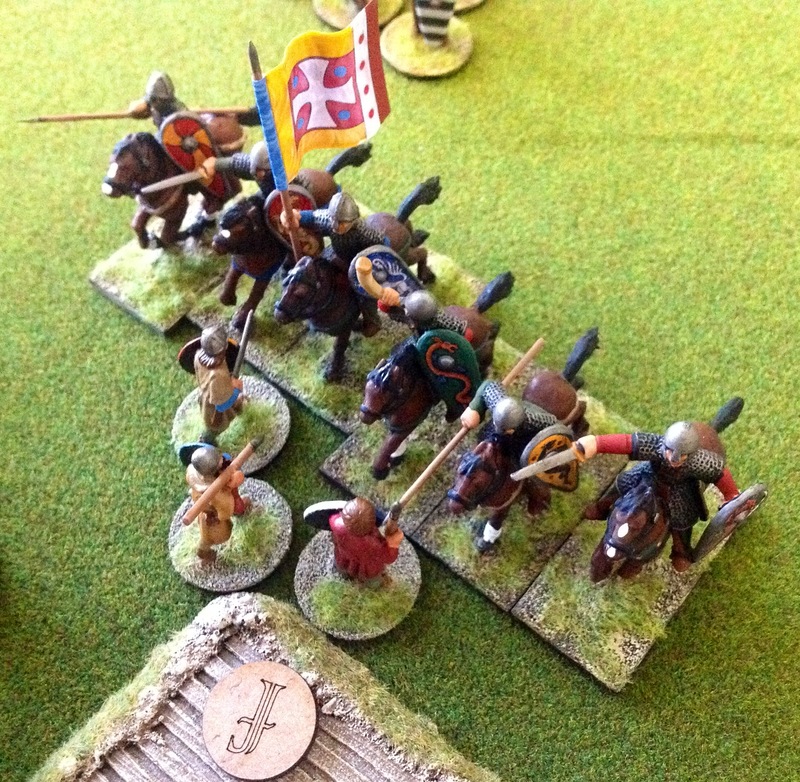 The Anglo-Danes had saved “Intimidation” for the charge coming at the Coerls on their right flank, but the Normans had enough activation dice to charge again and threw in the “Crushed” and “Pursuit” abilities for good measure. 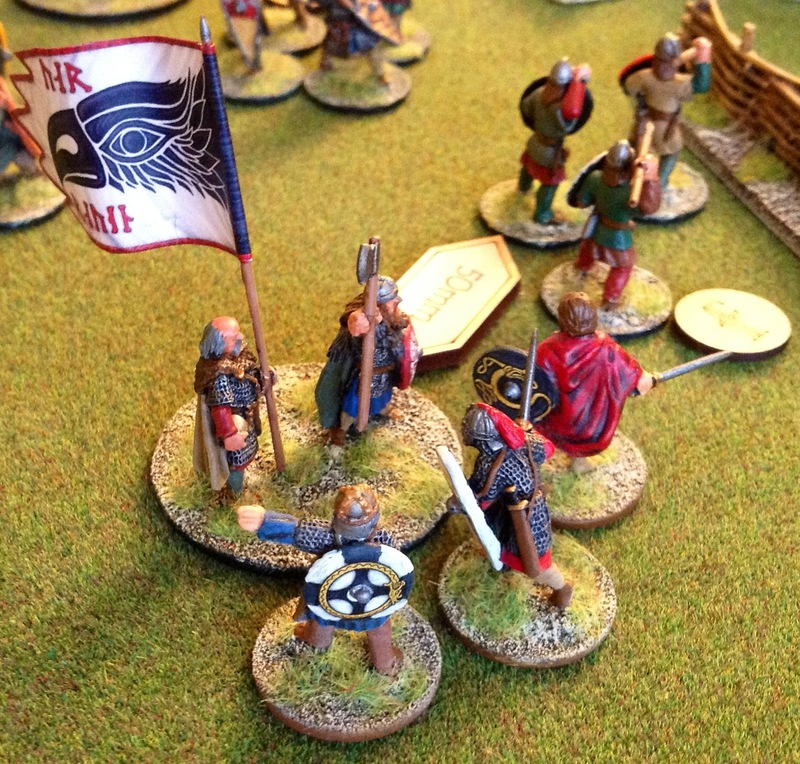 The Anglo-Danish “Shieldwall” ability raised their armour to 5 and they traded in some attack dice for defence dice, hoping at least to hold the charge and allow their Dane axe armed Huscarls to counter-attack in their turn. 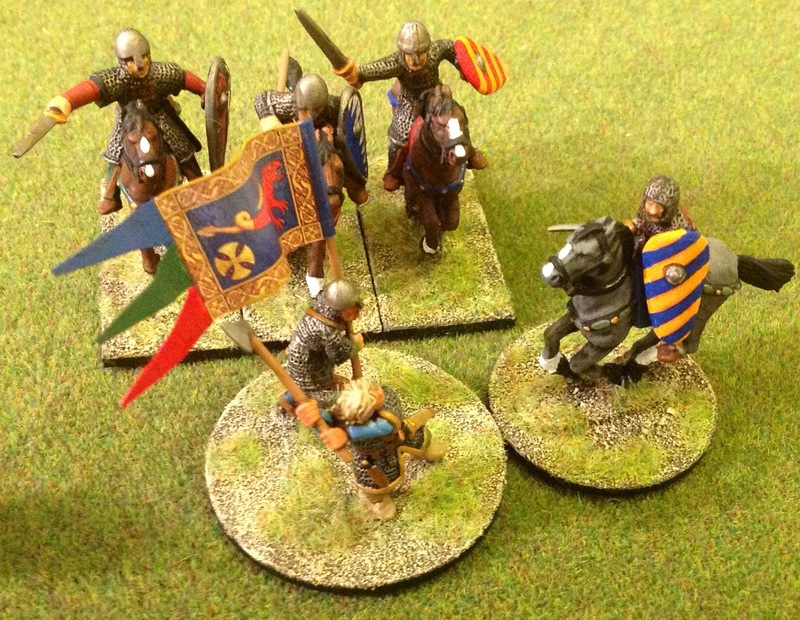 It was not to be – the Normans rolled 9 hits but even with all their defence dice the Anglo-Danes only saved one without killing a single Knight, so their unit ceased to exist. The Norman pursuit took them into the Huscarls with axes, though they had no Saga abilities to back up the charge and the Anglo-Danes had “Push” – they were hoping for at least a draw in the melee phase. Once again the Norman rolling was phenomenal, rolling 10 hits from 12 dice whilst the Anglo-Danes managed 3 hits. Out of 10 hits the Anglo-Danes only saved 3 and another unit bit the dust (adding fatigues to the nearby Warlord & Huscarls), though as all their hits went unsaved half the Norman Knight unit were cleaved by Dane axes. 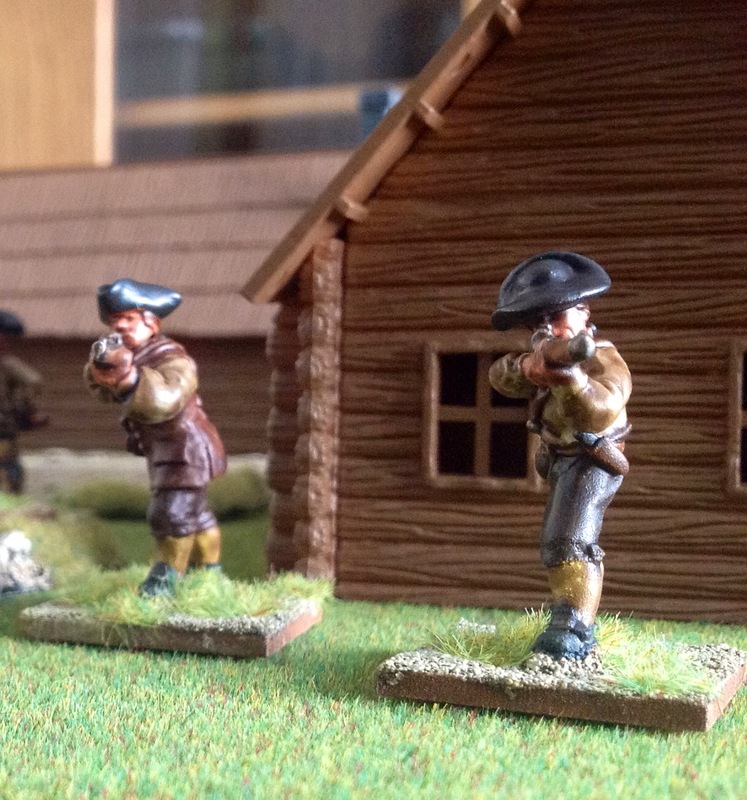 For our first face-to-face game of Muskets and Tomahawks we lined up with 200 points of troops each. The British force consisted of elite Rangers so only amounted to 14 men (though 1 man had a rifle) and an “officer” (by accident of birth only – see below!!). The French had a Canadian Officer with 14 Canadian Militia and 6 Huron allies. We rolled for the scenario and I got the “Scout” mission as the British (where I had to visit all 4 quarters of the board then get 1/3 of my force off the board to report the intelligence gained) while Nick got “Protection” as the French – to achieve his objective half of the 10 civilians under his care had to survive the game. The side-plot for the French was “Decipher” where the officer had to spend actions in order to decode a captured document, with each action spent during the game reducing the 12 needed to be rolled on 2 dice by 1. My Rangers on the other hand didn’t believe in their officer, so he had to kill 4 enemies to restore their trust before he could use his officer ability – this was crippling to my reaction rolls and use of the “Forward Boys” card from the start of the game. The first card out was the French “En Avant” card which allowed the French officer an action. 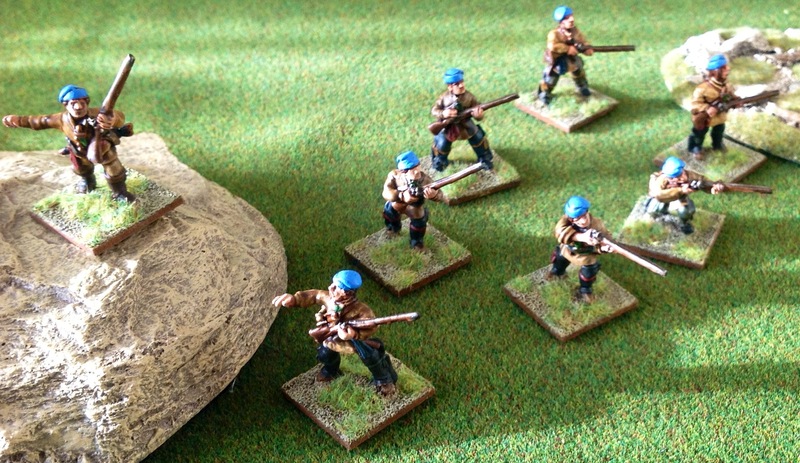 With all his men in position and no-one to shoot at, he of course chose to decode the dispatch as per his side-plot, picked up the dice and rolled the requisite 12 on 2D6 – side plot achieved and an early lead to the French! In response later in the turn, my rifleman drew a bead on a civilian at a cabin window and killed him stone dead with one shot, which caused panic amongst the other 5 civilians in the cabin – so much so that they routed (rolled a 1 in the reaction test) off the table, thus preventing the French from achieving their Protection objective as they only had 10 civilians and had to have 5 surviving at the end of the game – a case for splitting your civilians into 2 equal-sized groups if there ever was one! Both sides then got into cover and a long range fire fight ensued with the Indians refusing to turn up on a reserve roll to reinforce their French allies. So by turn 4 and with the British morale card in the deck, I had 5 men left and needed 2 move actions to get them off the table – any less men off and I wouldn’t achieve my “Scout” objective (I suppose someone has to survive to pass on the intelligence!). 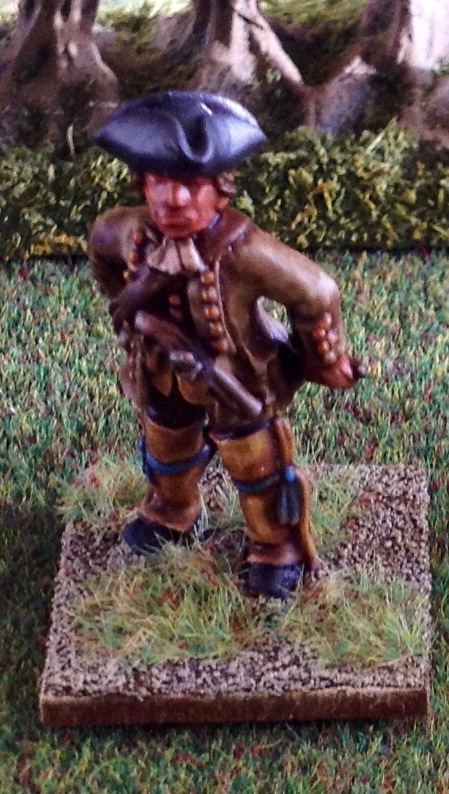 A British Irregular card turned up first would see the Rangers move out of musket range, but of course it wasn’t to be. First out came an Indian card and needing a 6 to hit followed by a 5 or 6 with 4 Indians firing the Rangers should have been OK, but the 4 dice produced two sixes followed by one five and a Ranger bit the dust. The British could no longer achieve their main objective and the French had also failed theirs, but their officer had achieved his side-plot so a marginal French victory was declared. Merde! This was a really fun game – we both liked the way side plots added to the experience, leaving both sides something to fight for after their main objective had been achieved or failed – this game would have been over too quickly otherwise. We used concealment and hidden movement for the first time in this game and this raised a few questions. (For example, can dummies spot dummies – yes, both are turned over according to the forum). While checking our rules queries from this game on the M&T forum, I noticed that Sotek486 has done a great job of pulling together an FAQ based on responses to rules queries – check it out at http://studiotomahawk.freeforums.org/m-t-faq-live-thread-t2634.html – also check out Sotek486’s battle reports – truly special. Next time my newly painted Virginia Provincials will be going down to the woods to team up with some Mohawk allies to see how the game plays at 400 points on a 6’x4′ table – watch this space. Below is a picture of my son’s troops trying to take out my warlord during a recent game of Saga. We were laughing about this incident yesterday in a tea break during a quick game of X Wing, then he changed the subject and started asking about ordering tickets for this year’s Salute – it was then I realised how quickly last year had flown in! I do look back on which boardgames I have managed to play over the year at New Year, but haven’t done so far with figure games, so here’s an attempt. I’m hoping this sort of thing will concentrate my painting efforts more on what needs to be done rather than what takes my fancy, but I also think it’s interesting to see what changes during the year – I mean, who would have thought Muskets & Tomahawks and Maurice would have featured so much in my gaming this time last year? On balance I seem to have played a lot more board games than figure games this year, which is disappointing, but may be something to do with the slow speed I paint figures at. Also, if I’m honest, my days of painting large armies are in the past and skirmish gaming seems to be the way I’m heading due to the low number of figures I have to paint – and why not? Saga, Dux Britanniarum and Musket & Tomahawks are fabulous rulesets which have inspired most of my painting this year (apart from the odd ACW unit diversion and WW2 tank). The fact that the figures needed are in 28mm (which I can see to paint) and small numbers of them are needed for these skirmish games is no co-incidence! 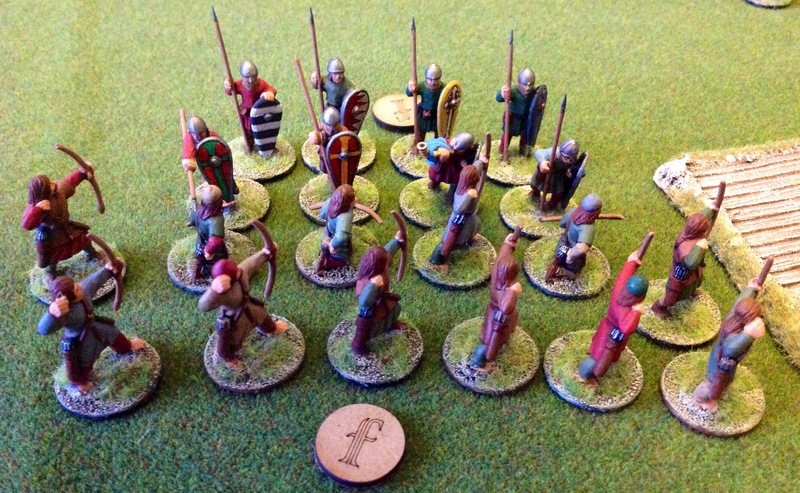 Dux Bellorum were also a set of rules I admired – though set at a higher level than the skirmish games mentioned, it takes a DBA-like approach of representing armies with 10-12 elements for which I have just used my normal Dark Age figures on sabot bases. I have only played 2 large scale games all year, what I would call battles as opposed to skirmishes – Field of Battle 2 was used for a Napoleonics game and Maurice was used for Marlburian. Of the two, Maurice was my favourite (just) though my regular opponent favoured FoB2 – to be fair they are both excellent and I would be willing to play either at the drop of a hat. 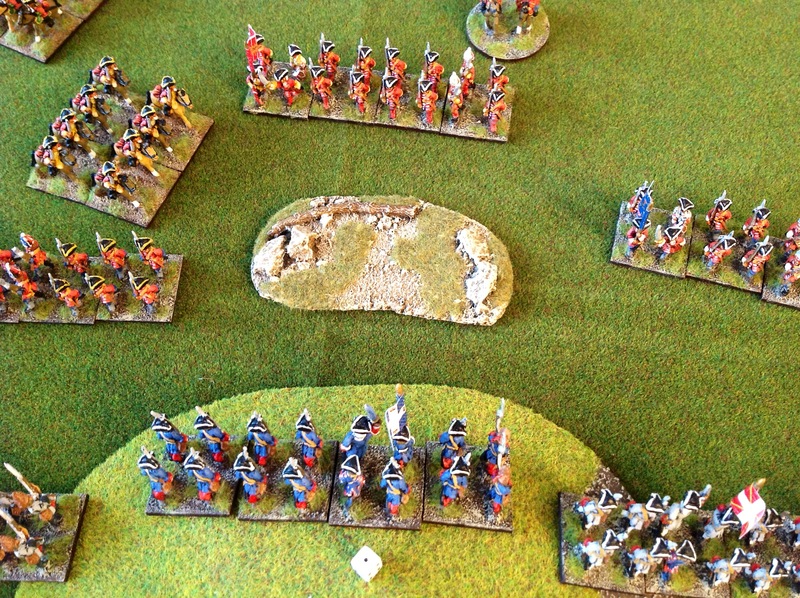 A piece of terrain appears to foil the British cavalry! I enjoyed the mechanics in “Maurice” from Sam Mustafa, so I’m really looking forward to his new set “Longstreet” which will incorporate many of the same mechanisms, especially as I have loads of ACW troops painted and ready to go (for a change!). I’m also looking forward to the Raiders supplement for Dux Britanniarum and have a pile of Picts waiting to be painted when I know what the army composition will be – these will also serve as Irish in Saga Irish (I got the new Raven’s Shadow Saga supplement for Christmas). Too Fat Lardies platoon level set Chain of Command may also knock Bolt Action off its perch as the favoured set of WW2 rules, but whatever set wins (because my wife bought me the new plastic Warlord WW2 Russians for Christmas) I expect a force of Ruskies for one of these rulesets in the offing around Easter. And talking of Too Fat Lardies, I have yet to play IABSM. I’m planning 8th Army against DAK in 10mm if my eyes are still up to it! It’s a long list and a short year, but at least everything on this list apart from the WW1 stuff is painted (or close to it…). Let’s see how we get on.